In the following article we will discuss the advantages of a buy-sell agreement funded with life insurance, as well as the importance of disability insurance. Subjects touched upon will include the steps to creating a buy-sell agreement, putting disability and life insurance in buy-sell agreements to work, the types of life insurance used to fund buy-sell agreements, and how we can help you find the lowest premiums on your protection. We work with dozens of the top life insurance companies in the U.S. Give us a call today to see what we can do for you. In the simplest terms, it is an agreement between business owners on buying and selling the business. There are many nuances to a buy-sell agreement. If your buy-sell agreement is not set up properly it could end up causing a lot of grief to your fellow business partners, their family and your family members. Therefore, buy-sell arrangements should only be structured by an experienced business law attorney. The first step of implementing a buy-sell agreement funded with life insurance is to consult with an experienced business law attorney who can structure your arrangement. The size of your business will typically determine the level of difficulty of properly structuring your buy-sell arrangement. The next step, or simultaneous step, would be to begin the process of obtaining life insurance for the buy-sell agreement. The reason you want to move on obtaining insurance right away is because the approval process can take a few days to a few months depending on the size of the policy and the health of the proposed insured. If you need insurance fast you can always apply today with the best no medical exam term life insurance companies. And if you are satisfied with the no exam coverage then simply keep the policy. Alternatively, if the cost of the no exam policy seems a bit high you can always apply for a fully underwritten policy at a later time to replace the no exam policy. Another benefit to no exam coverage is it allows the insured to lock into coverage before taking an exam. If you have not had a medical check-up in awhile then consider the advantages of no medical exam versus exam life insurance. Depending on the type of business determines how the insurance proceeds are utilized. We will address life insurance in buy-sell agreements for corporations, partnerships and sole proprietorships using entity purchase agreements or cross purchase agreements. There are other agreements available, such as Trusted Cross Purchase, Wait-and-See Buy Sell, and No-Sell Buy-Sell. In a partnership, typically the two co-owners will get insured and name one another as the owner of each others policy. When a buy-sell agreement is funded with life insurance, the policy owner uses the insurance proceeds to purchase the business interest of the deceased owner’s interest at a predetermined amount. This type of buy sell agreement is called an Entity Purchase Agreement or Stock Redemption Agreement. The benefit here is that it provides the family of the deceased owner with cash instead of non-marketable company stock. The remaining owner is then freed up to carry on the business without the deceased owner’s family getting involved in the affairs of the business. Further, this protects the business from being dissolved upon the death of a co-owner. Finally, the business has a quick influx of liquid income (i.e. cash) that may also be used by any remaining co-owners if the business is in need of liquidity. 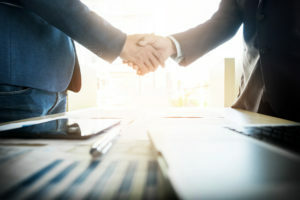 For larger businesses with more than two or three owners, such as an LLC, C Corp, or S Corp, a different buy sell strategy called a cross purchase agreement, can be effectively implemented. This buy sell agreement strategy requires the insurance to be taken out on all the business owners and makes the business both the owner of the policy and the beneficiary. This way all money flows back into the business to be used as necessary by the remaining business owners, as the remaining owners use the cash to “buy out” the deceased business owner’s interest.We recommend you consult with a tax professional for potential tax ramifications to the business from this strategy. In a sole proprietorship, typically the business will not continue when the sole owner dies. The main issue is that any heir of the business owner is not knowledgeable of the business and the nuances associated with the continuation of the business. Therefore, the buy-sell agreement funded with life insurance, typically in the form of key person business life insurance, will be able to provide liquid assets to the deceased owner’s family as they wait on an appropriate suitor to purchase the business. This strategy also helps avoid “fire sales” where the business is sold for pennies on the dollar due to the need to liquidate assets to wrap up the deceased owner’s business and estate. One last note for a business owner who also is the primary bread winner of the household: you should get insured as soon as possible. If you are the main income earner, then regardless if you have a buy-sell in place or not, life insurance should still be at the top of your list as a business owner simply because it means your family will be protected financially when you die. Please don’t put off getting at least some life insurance in place as you continue to make strides to grow your business. If a partner or co-owner of the business does not die, but instead is diagnosed chronically ill, or suffers form a severe cognitive disorder, such as due to stroke or Alzheimer’s Disease, a buy sell funded with long term care insurance rider may provide the resources needed to fulfill the terms of the buy sell agreement. A chronic illness accelerated benefit rider in a buy sell agreement requires that the condition be permanent. If there is a chance of the partner or co-owner recovering, he or she may not qualify for the chronic illness rider. A terminal illness rider is also an option to provide for the buy sell agreement. However, the rider requires the insured be diagnosed as terminally ill with 12 months or less to live. Finally, life insurance with long term care rider provides either a cash indemnity benefit or reimbursement. Ideally, the cash indemnity policy would be the most beneficial but you would need to make sure the buy sell was structured properly and with the correct company that understood your insurance goals and objectives. With a long term care rider, the insured does not have to be diagnosed as no potential for recovery. For example, if the partner suffered a stroke, but showed positive signs that a recovery were possible, they still may qualify, whereas under a chronic illness benefit, the company may refuse. We highlighted this topic in red because most business owners have never considered using long term disability insurance in a buy-sell agreement as protection if a forced buy-out due to disability occurs. That stats don’t lie, you have a much greater chance of being disabled before age 65 than dying. Yet the majority of buy-sell agreements neglect to consider the ramifications of one of the business owners or key persons becoming disabled. Here is what happens. You and your business partner are making things happen, growing the business, finding much success, when out of nowhere your business partner has a health issue or injury that puts him or her out of commission. Now, the business is suffering because they cannot do the work load they previously had. And to make matters worse, they still expect the same paycheck from the business. You are forced to face the reality that your business is in trouble. Enter the buy-sell agreement funded with disability income insurance. With a disability income insurance policy, if a business owner becomes disabled the insurer will pay a benefit amount to the beneficiary, the other business owner(s) who is not disabled to be used as a buy-out. This is very effective, particularly when total disability is involved. Some factors that are considered by the provider are the type of business you are in, the benefit amount, the benefit period (monthly or lump sum), the elimination period, the definition of total disability, etc. Another option business owners should consider is business overhead expense insurance. If you or a business partner, even a key person, should become disabled, the BOE insurance provides income to pay business expenses, until you recover, the key person is replaced, or the business is sold. The BOE insurance benefit can be tailored to last up to 24 months. If you need to speak to our team member who specializes in these advanced types of business owner disability insurance policies, please give us a call today and let us know what you are looking for. Business continuity by providing remaining owners with cash to purchase deceased owner’s shares. Provide income for deceased owner’s family in case of death or disability. In a partnership, prevents members of the deceased owner’s family from becoming business partners. Provides fast access to liquid assets to protect against “fire sales” of the business, to pay creditors, and to essentially “buy” time for the business to wrap up or be sold. The death benefit from life insurance proceeds is typically income tax free. Enhance credit risk because a succession plan is in place. Using an Irrevocable Life Insurance Trust may be beneficial. Please consult with your business attorney. Life insurance with long term care rider or chronic illness rider if co-owner is diagnosed as chronically ill or with a severe cognitive disorder. What are the disadvantages to buy-sell agreements funded with life insurance? The cost of the life insurance premium might create financial problems to the company, especially if one or more of the owner’s has pre-existing health issues which make the premiums more expensive. Read how we go the extra mile for our clients with pre-existing conditions. If the premiums do create financial problems for the company, the policy might interfere with the business or owner using that income for other purposes. For this article on funding a buy sell agreement with life insurance we interviewed Jack Friedell, an experienced business law attorney in Southern California. What are the potential pitfalls of setting up a buy sell agreement? The largest pitfall I see in the establishment of a buy-sell agreement is a lack of understanding on the function of the agreement, which is demonstrated by the failure to properly fund it. A properly planned and executed buyout agreement will govern the situation if a co-owner dies, or chooses to leave the business. Unfortunately, the ability of a business to buy-out a co-owner (or a co-owner’s estate) is often limited based upon the capital required for small businesses to remain operating. The best solution for liquidity of a buy-sell agreement is the purchase of term or whole life insurance policies on each owner to guarantee that the deceased owner’s family is paid the true value of the business interest while still allowing the company to preserve their assets to ensure continued operation. What type of advice would you give to partners or owners of closely held businesses who are considering a buy sell agreement? I recommend that any partners, or owners of closely held businesses (Corporations or LLCs), discuss buy-sell agreements with a qualified attorney in their state. An attorney will be able to meet with the owners to determine their goals and outline valuation options when the buy-sell option is triggered. A properly prepared buy-sell agreement not only contemplates a co-owner deciding to sell their interest or passing away, but it also mandates that the sale of a business interest is not sold to an outside third party. This portion is essential to guarantee control by the owners and guarantee that they do not lose the business to outside interests. This is performed by the requirement that any owner who chooses to sell their interest gives the right of first refusal to the remaining owners. Any other thoughts you might care to share? Many small business owners do not undertake the essential process of proper business succession planning based upon their ignorance of the ability to use life insurance as a tool to fund the buy-sell agreement. The relatively small expense related to the purchase of term policies eliminate the excuses. If you are a co-owner of a business, for the sake of your family members and business partners, please take the time to research all of the benefits of a buy-sell agreement and the great resource that term insurance policies serve in funding. The underwriting formula to determine how much life insurance a business owner can get to fund a buy-sell agreement takes the percentage ownership of the proposed insured and multiplies that percent by the fair market value of the business, adding in an additional modest growth factor. An underwriter will also inquire into whether or not other owners are insured. Using life insurance to fund a buy sell agreement requires some planning as to the type of policy to use and the best company to choose. Three types of life insurance to use for funding buy-sell arrangements are term, universal and whole life. For more advanced markets concepts regarding buy sell agreements, please visit our article on infinite banking. the advantages of funding a buy-sell agreement with term life insurance is that the business can a save considerable amount of money. The disadvantage is that term life insurance ends upon the expiration of the term length, which typically ranges from 10-30 years. However, term life insurance generally comes with a conversion option which allows the owner to convert the policy into permanent insurance with no proof of insurability. Meaning, the policy can always be converted to a permanent policy no matter what health conditions the primary insured has developed over the years because the policy is converted at the original rate class qualified for. Further, some companies allow the policy to be renewed up to age 95. Note, however, that the premium will go up each year if you choose this option. Cash value whole life insurance has many benefits and may be superior to term life when dealing with business succession planning. Another option is Universal Life. Universal Life: There are three main flavors of universal life insurance: guaranteed, variable, and indexed universal life insurance. All three are permanent policies and build cash value. The advantage of using universal life insurance to fund a buy sell agreement is that the cash value can be used for various purposes, such as a buyout of an owner for retirement or due to disability. Additional living benefit riders, such as chronic illness and disability, can be added. Another advantage to Universal Life is the policy last the rest of the owner’s life or owners’ lives. The disadvantage of universal life or any type of permanent life insurance is the cost. If your business has plenty of cash available then cost might not be an issue. However, if you are a start up or new business you might want to consider term and simply convert the coverage down the road, if necessary. Survivorship life insurance is another great option for funding a buy-sell arrangement where one or both partner’s spouse is also involved in the business. For example, a business partnership has been formed and one of the two owners works in conjunction with his or her spouse. Upon the death of one spouse, the other spouse plans to continue on instead of having his or her share of the business purchased by the other partner. Survivorship or second to die life insurance pays out upon the death of the surviving partner/spouse. An advantage is that the premium is lower than the combined premium of two separate universal life insurance policies. This allows the husband and wife team to save on the cost of life insurance by both being insured on the same policy. Once you have decided on the right type of policy for you, don’t forget to prepare for your life insurance exam! Check out our article: Tips for acing your life insurance medical exam. TermLife2Go specializes in finding the lowest cost life insurance available for our clients by focusing on each unique niche of the various life insurance carriers in the marketplace. We stay on top of the latest trends and know who to go to for various health and lifestyle conditions. For example, you want to apply for life insurance with diabetes with the most diabetic friendly carrier available. And who that may be can, and often does, change. The difference between companies that have looser underwriting guidelines and those who have standard guidelines can be substantial. Which in turn can make a big difference between the premium payment or if the insurance is even approved. Therefore, if you desire the lowest premiums for your life insurance, give us a shot at saving you thousands over the life of your insurance policy. We have helped many business owners secure affordable life insurance to fund a buy-sell agreement and we can help you as well. We are here to serve! We do not favor one life insurance company over another. Instead, we find out what you need and then we recommend the lowest priced, best life insurance company to meet your specific need. Therefore, if price matters to you, give us a chance to earn your business. Thank you for reading our article, buy sell agreement funded with life insurance. Please leave any questions or comments below. This information is designed to provide a general overview with regard to the subject matter covered and is not state specific. The authors, publisher and host are not providing legal, accounting, tax, or specific advice to your situation.